Warm olive oil over medium heat. Saute the garlic then add sun-dried tomatoes, spinach, salt, pepper, and thyme. Put it into a bowl and stir in the goat cheese and cream cheese. Cut a pocket into the pock chop and stuff with the mixture. Season the pork with salt and pepper. 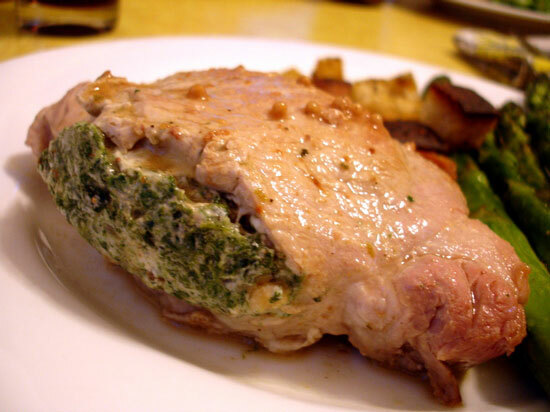 Cook the pork with the olive oil until golden brown (about 4 minutes per side). Tent the pork for a couple of minutes. Add the chicken broth and reduce. Add the lemon zest, lemon juice, and mustard and serve with the pork. Now that's a pork chop! What a delicious dish - I love all of the ingredients used. I love sun-dried tomatoes! I have some of these chilled..happy foods!